They say that good things come in small packages, and that’s definitely the case with Israel’s Olympic team. This year the Israeli team has only ten competitors, which is double from previous years. In classic Israeli fashion, most of them are not native Israelis, in fact, only two competitors can call themselves sabras (native Israelis). Athletes from London, Ukraine, and the United States have all joined the Israeli team with pride, and the small team is making a big impression in PyeongChang. One of the stars of the figure skating group, Aimee Buchanan, states that her first trip to Israel was in 2014 when she was twenty. During that trip, she formally made aliyah but remained in the States for training. “I was over the moon happy when I found out I would be skating for Israel,” she states in an interview with the Times of Israel. There is Paige Conners, who missed the tryouts for the American team due to illness. Her mother, being an Israeli citizen, suggested she try out for the Israeli team. Sure enough, she made it and is now proudly competing for Israel in ice-skating. With competitors in alpine skiing, figure skating, short track speed skating, and skeleton the Israeli flag has made its appearance, and while the Israeli team did not make the finals, it is perhaps a sign of the future of Israeli sport and competition internationally. Until recently Israel has not placed a big emphasis on sports, and high school sports are not part of the educational curriculum like they are in the United States or even Europe. For most public high schools, competitive sports are not even an option, and if someone wants to compete, they need to find a private team. The reason for this is mostly due to mandatory military service for all Israeli citizens. At the age of eighteen most Israeli youngsters draft into the IDF, and only a few are given the proper time off to train and practice for international sports competition. Additionally, there is no national budget for Israeli athletes, and most have to work while training or make minimum wage. During the Rio Olympics Israel brought home the bronze medal in Judo, and the country went crazy. Since then the country has made efforts to offer better sports training and programs for Israelis with hopes for continuing to grow its Olympic medal collection. While budgets are low for Israeli athletes, it doesn’t stop all from pursuing their dream. Adam Edelman, known as the Hebrew Hammer, a competitor in skeleton, starting raising funds two years ago so he could properly train for today’s winter games. 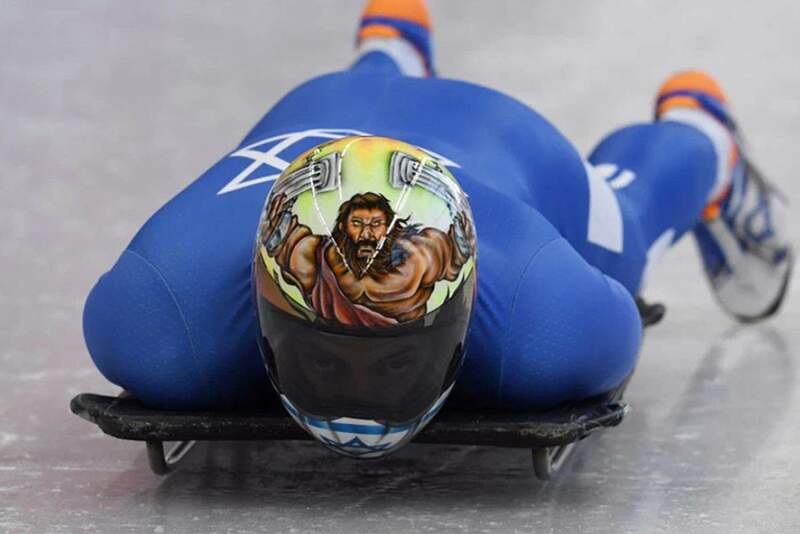 On his path to the Olympics he proudly wore the Star of David on his uniform, and his helmet depicts Samson standing between the two pillars. Israel Skeleton & the Winter Olympics from Adam Edelman on Vimeo. Unfortunately, the Israeli team did not place in any finals this go-around. However, they did show significant improvement since the last winter Olympics. While Team Israel will be not progressing to the medal podium, there are several Jewish athletes in the Olympics this year who have. Competing mostly on the United States team, Arielle Gold received the bronze medal in the half-pipe snowboarding event. Jonathon Blum of the US men’s hockey team and Jason Brown on the US men’s skating team will also represent the United States and their Jewish heritage.